Is your developer ripping you off? Asked your dev for a time estimate and then… the number you got was outraging, for the seemingly simple changes. In the back of your mind, a thought slips they’re taking advantage of you. There are a few things at play here. The developer might have misunderstood the requirements. There is a chance that your developer might have accidentally over-complexified what’s required and estimated based on that. If you think that’s the case, just talk about it to them. Make sure if you’re both on the same page. If you indeed are, read below. 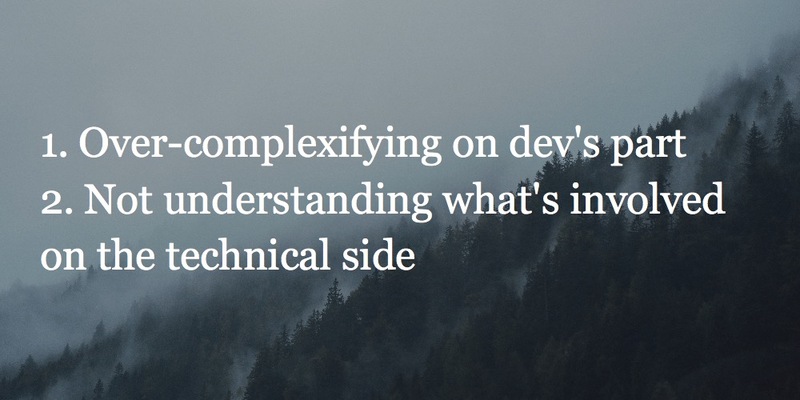 You might not understand the full scope of what’s required on the technical side. It all takes time. 4 hours for a “report problem” form can sound like too much to you, but it’s not. In fact, many consultancies will probably estimate that even higher. There’s simply no “add new features” button for your devs to press. You should trust your developers. Even more so if they’ve been great to work with! They are the experts here and have the most knowledge of what’s involved. Is the time it takes them to implement the feature relevant? You are in the business. You hire developers to provide expertise where you lack it, and make your life easier. Think of it in terms of costs and benefits. If the price of this new feature is less than the value it provides to your business, you’re good.